You want to explore Cuba’s rich culture. Be transported back to a simpler time. Experience Havana’s romance and beauty with the same carefree joy as the locals. See everything you want to see and go everywhere you want to go. The Real Havana guidebook shows you how to do all that and lots more. Authentic Cuban cuisine and affordable restaurants. Low-priced markets, shops and entertainment options. Instructions on using communal taxis particulares and all the major routes. Hundreds of tips on saving money. BONUS: The last section of this book includes the “Cheap Casa Particular Guide.” You will find listings and reviews of over 30 apartments and rooms to rent in the Vedado neighborhood of Havana. These casas particulares have been hand selected out of the thousands available in city. They are not only the most affordable, but they are also among the cleanest, best maintained, and best located. The hosts are extremely hospitable and most speak multiple languages. You get the full contact information for the casas. For your convenience, you can book your stay online and never pay any expensive brokers or middlemen. You are certain to save at least $5 to 10$ per night in brokerage fees. That alone is easily worth the purchase price of the guidebook. This guidebook is not a tourist guide. It’s not a list of restaurant reviews and attractions, like all the other guides. With this guidebook, you will learn about the authentic, local places. Locations which are hidden to regular tourists. Naturally, these places are also very inexpensive. So, in effect, you will not only be immersed in authentic Cuban life, but you will also save money. Other guidebooks are designed for tourists who want to act like foreigners, and be treated like foreigners. The Real Havana guidebook is designed to show you how to live like a Cuban. You will quickly gain the knowledge to assimilate yourself into the culture and immerse yourself in a truly different travel experience. The information in the guide was accumulated over years of travel throughout the island. From the largest city to the smallest farm communities; information, tips, and tricks were collected from countless local Cubans, and now it is available to you, in a succinct, easy to understand travel book. It’s a road-map to exploring the real Cuba. Full Compass Guides are aimed at travelers who want to understand local customs and culture so that they can experience destinations like a local. Unlike regular tourist guidebooks, Full Compass guides are not a list of attractions popular with tourists, and boring restaurant and hotel reviews that are obsolete the moment they are published. With our guides, you get succinct, useful information about the culture, people and geography of your destination so you have the tools and the confidence to explore on your own, experience everything that your destination has to offer, and save money. Our guides are written by experienced travelers who have intimate knowledge of both the location and the culture of the destination. They give you the exact information you need in order to make the most of your travel time. Learn more about Mario Rizzi, the author of the Real Havana series, for Full Compass Guides. With a Full Compass guidebook, you will be a knowledgeable explorer, rather than just another flash-happy tourist. Experience the real Cuba and save money in Havana! 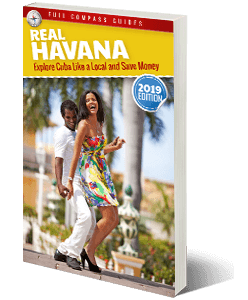 Purchase the Best Cuba and Havana Travel guide: Real Havana.